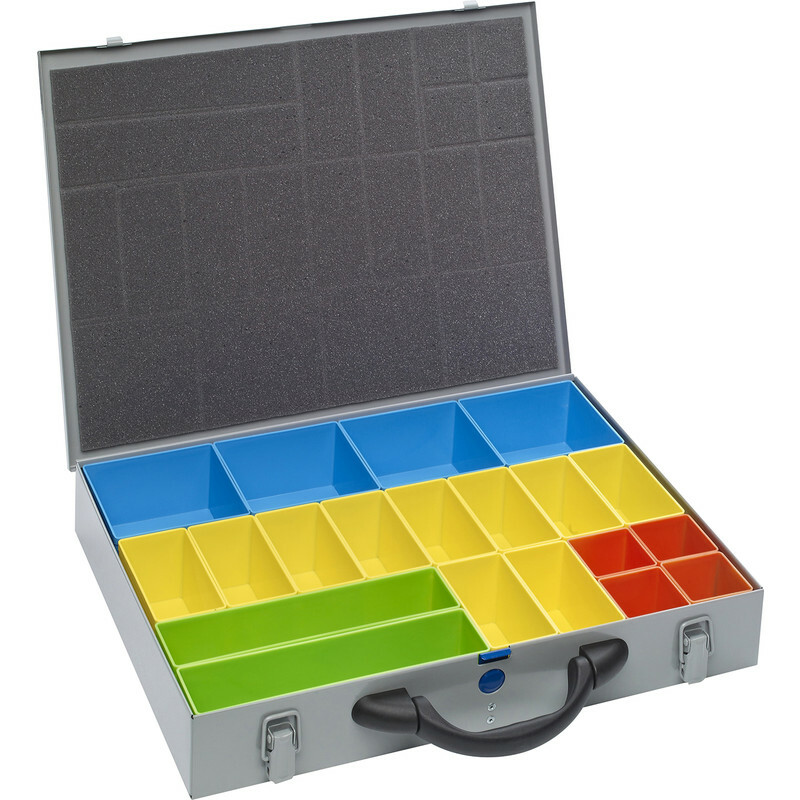 Tough metal case with individually removable plastic divider boxes. Large Screw Case Single 440 x 330 x 66mm is rated 4.5 out of 5 by 11. Rated 4 out of 5 by CliveUnique from Decent boxes for the money Slightly different from picture as ones supplied have plastic handles which I prefer as they are quite heavy duty and more comfortable than other boxes i have with metal handles. The inserts seem a tad flimsier than my other boxes (might just be me) but cant see that being an issue. I chose these particular ones as I liked the selection of sizes of the inserts and they have worked out just about right. Very happy with purchase so far but only time will truly tell. I have rated reliability as three star only because I dont know yet. Rated 4 out of 5 by brian p from does the item do the job this screw case was fine for me. and yes it does do the job especially the foam at the top inside for holding screws in place. Their is a catch near the handle but could not get it to work. Rated 5 out of 5 by jemyvette from great product I am very impressed with this metal storage box especially with a safety catch in case you pick it up or move it accidentally before closing, very strong and definitely worth the money! Rated 5 out of 5 by Dave D from The Mother of all screw cases What a big box to keep your screws in.